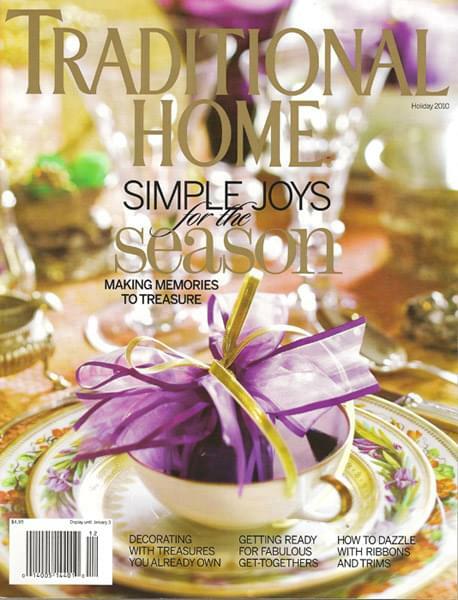 The 2010 Holiday issue of Traditional Home features a beautiful southern home designed by the talented Sandy Lucas and Robert Dame. The plantation-style house that was influenced by the architecture of the late A. Hays Town, has a distinctive Creole flavor. The spread features the home decorated for the holidays. The rugs throughout the house are from Matt Camron, and add to its southern charm. The Great Room-- Osborne & Little fabric covers the sofa. The medallion chair fabric is Brunschwig & Fils; its blue welt is Schumacher. The palette is pulled together by a large antique Serapi rug from Matt Camron Rugs and Tapestries. A close-up of the beautiful Antique Serapi. Eighteenth-century Venetian bronze doors flank the dining room archway. The antique doors are from Matt Camron as well. View into the beautiful dining room. The tufted custom headboard is dressed in a Cowtan & Tout fabric. An antique bench at the foot of the bed goes subtle in a Fabricut solid trimmed with Scalamandré gimp. The blanket cover and shams are from Hamburg House. Softening the room is a Matt Camron antique reproduction Tabriz. A Matt Camron Farahan rug in the bathroom. Another Matt Camron antique serapi is used in the office. For the full article and more pictures of the gorgeous home, GO HERE.